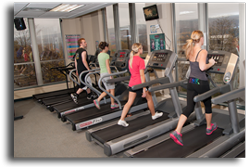 At LCCC's Fitness Center, we encourage healthy lifestyles and regular physical activity in an educational setting to our faculty, staff, and students at Luzerne County Community College. LCCC's Fitness Center is comprised of a Weight Training Room, Cardio Room, and Aerobics/Yoga Room. 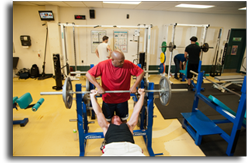 Membership for the LCCC Fitness Center is provided as a benefit to LCCC students, faculty, staff and retirees. Non-registered students who are not employed by the College may obtain membership by registering for HPE-FLS (Fitness Lifestyles). This course will not apply towards graduation requirements and will not be limited to the current repeat policy for credit courses. Guest Cards are available under certain conditions. Guest Card distribution must be authorized by the Physical Education Department Chair or their designee. Membership includes the use of locker rooms, fitness room, and aerobic room. Fitness Center users must present a valid student or staff member I.D. for admittance to Fitness Center facilities. Users under the age of sixteen must be accompanied by a parent or guardian at all times when visiting the Fitness Center. Lockers are for temporary use only. Users are required to remove their property from Fitness Center lockers immediately following usage. The College reserves the right to remove items left in lockers. Those items, as well as any unattended items left in any Fitness Center area, will be forwarded to the LCCC Security Office and will be subject to the College's lost and found policy. All College policies regarding appropriate conduct on College property applies to usage of the Fitness Center. In addition, users must follow all safety and health guidelines posted in the facility. Chewing gum, food and soda cans/bottles are prohibited in the facility. Appropriate athletic footwear is required in all areas. Users may be required to reimburse the College for damaged, lost, or stolen equipment that has been signed out in their name. If found violating the posted Fitness Center usage rules and guidelines, users will be asked to refrain from that activity and to comply with College policy. Continued or repeated violation will be reported to campus security and may result in revocation of Fitness Center privileges and/or other disciplinary measures as defined in the Student and/or Employee Conduct Code.